Also Available With PFA Insulated Cables (260ºC Maximum Temperature), Fiberglass Cables (GG), or Fiberglass Cables With SST Overbraid (-SB). Fiberglass Cables have 500ºC Maximum Temperature, See Individual Product Sheets. 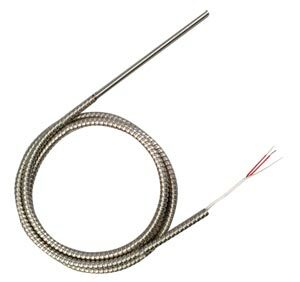 These general purpose RTD probes contain Omega's DIN Platinum thin film RTD elements connected directly to fiberglass insulated and jacketed cables without the need for extension wires or metal transition fittings. A stainless steel BX flexable hose runs from the end of the sheath to within 6" of the end of the cable for protection in rough environments. This design makes for a more compact and reliable probe where space limitations are a factor. For this product with a PFA insulated and jacketed cable click this link. For this product with a fiberglass insulated and jacketed cable click this link. For this product with a stainless steel braided fiberglass insulated cable click this link. Standard:To order probes in intermediate lengths (2" minimum), change length in model number and use next longer probe price. To order 2-wire sensors, change "-2" to "-1" in the model number at the same price. To order 4-wire sensors, change "-2" to "-3" in the model number and add $5 to the price. For probe lengths over 24", change length in model number and add $1 per inch of probe length. Cable length refers to length of metal hose with cable extending 6" minimum from end of metal hose. For metal hose lengths longer than 40", add length to end of model number and add $2.50 per foot. Metric: To order probes in intermediate lengths (50 mm minimum), change length in model number and use next longer probe price. For probe lengths over 600 mm, change length in model number and add $1 per 25 mm of probe length. Cable length refers to length of metal hose with cable extending 150 mm minimum from end of metal hose. For metal hose lengths longer than 1 meter, add length to end of the model number and add $7.50 per meter. For MTP or OTP connectors, add "-MTP" or "-OTP" to model number and $8 to price.